The Seuna, Sevuna or Yadava dynasty (850 - 1334) was an Indian dynasty, which at its peak ruled a kingdom stretching from the Tungabhadra to the Narmada rivers, including present-day Maharashtra, north Karnataka and parts of Madhya Pradesh, from its capital at Devagiri (present-day Daulatabad in Maharashtra). The Yadavas initially ruled as feudatories of the Western Chalukyas. Around the middle of the 12th century, they declared independence and established rule that reached its peak under Singhana II. The Seuna dynasty claimed descent from the Yadavas and therefore, its kings are often referred to as the "Yadavas of Devgiri". The correct name of the dynasty, however, is Seuna or Sevuna. The inscriptions of this dynasty, as well as those of contemporary kingdoms, the Hoysala, Kakatiya dynasty and Western Chalukyas call them Seunas. The name is probably derived from the name of their second ruler, "Seunachandra". The Seuna dynasty claimed descent from the Chandravanshi Yadavas of north India. According to verse 21 of Vratakhand (a Sanskrit work by Hemadri), the Seunas were originally from Mathura and later moved to Dwaraka. Hemdari calls them Krishnakulotpanna (i.e., descendants of Lord Krishna). The Marathi saint Dnyaneshwar describes them as yadukulvansh tilak. 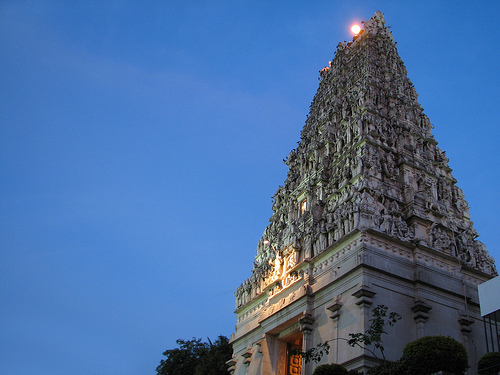 Some Seuna inscriptions call them Dvaravatipuravaradhishvaras ("masters of Dvaravati or Dwaraka"). Several modern researchers, such as Dr. Kolarkar, also believe that Yadavas came from North India. According to scholars such as Prof. George Moraes, V. K. Rajwade, C. V. Vaidya, Dr. A.S. Altekar, Dr. D.R. Bhandarkar, and J. Duncan M. Derrett, the Seuna rulers were of Maratha descent who patronized the Marathi language. Digambar Balkrishna Mokashi noted that the Yadava dynasty was "what seems to be the first true Maratha empire". In his book Medieval India, C.V.Vaidya states that Yadavas are "definitely pure Maratha Kshatriyas". 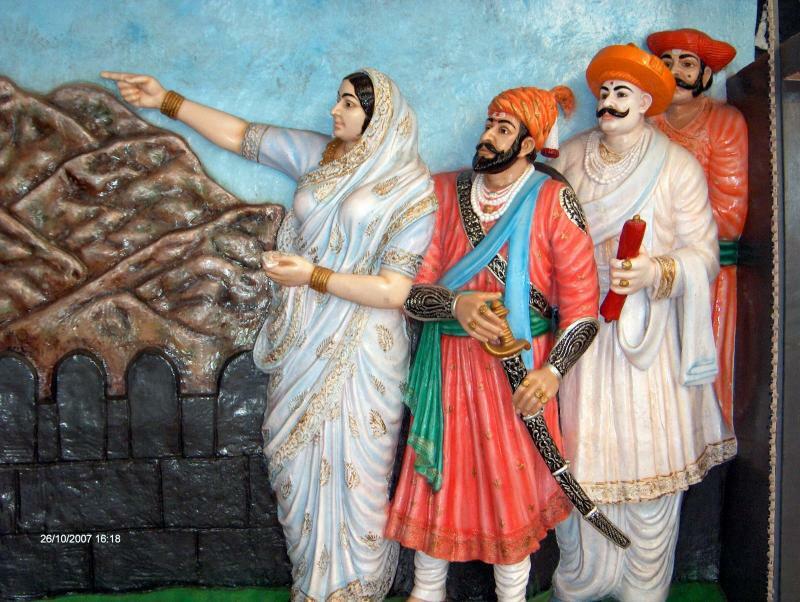 Jijabai (the mother of Shivaji, who founded the Maratha Empire) belonged to the clan of jadhavas of Sindkhed Raja, who also claimed descent from the Yadavas. There is a belief that Deoghur or Doulatabad was built in AD 1203 by a Dhangar or herdsman (Yadav Cowherds) who, acquiring by some unusual good fortune, vast wealth was named by his brother shepherds Raja Ram and soon after assumed the rank of a Raja. Scholars such as C M Kulkarni, Colin Masica, and Shrinivas Ritti believe that the Seuna rulers were originally Kannada-speaking people. Linguist Colin Masica believes that they originally used Kannada (along with Sanskrit) in their inscriptions, but, by the time of the Muslim conquest, they had begun to patronize Marathi, and Marathi phrases or lines began to appear in their inscriptions. Dr. Shrinivas Ritti speculates that the Seunas were originally from a Kannada-speaking region and migrated northwards owing to the political situation in the Deccan. Many Seuna rulers had Kannada names and titles such as "Dhadiyappa", "Bhillama", "Rajugi", "Vadugi" and "Vasugi", and "Kaliya Ballala". Some kings had names like "Singhana" and "Mallugi", which were also used by the Southern Kalachuri dynasty. Records show that one of the early rulers, Seunachandra II, had a Kannada title, Sellavidega. The Seunas had very close matrimonial relationships with royal Kannada families throughout their rule. Bhillama II was married to Lachchiyavve, who was from a Rashtrakuta descendant family in Karnataka. Vaddiga was married to Vaddiyavve, daughter of Rashtrakuta chieftain Dhorappa. Wives of Vesugi and Bhillama III were Chalukya princesess. Over five hundred inscriptions belonging to the Seuna dynasty have been found in Karnataka, the oldest being of the rule of Bhillama II. Most of these are in Kannada language and script. Others are in the Kannada language but use Devanagari script. The Seuna coins from the early part of their rule have Kannada legends. Scholars such as Dr. O. P. Varma believe that Kannada was a court language, used along with Marathi and Sanskrit. During the rule of the Seunas, ruling chieftains who were related to the Seuna kings were from Kannada-speaking families, like the Seunas of Masavadi in present day Dharwad. Dr. A. V. Narasimha Murthy opined that during the later part of the Rashtrakuta rule from Manyakheta, Seuna chieftains were despatched from the Karnataka region to rule near Nasik. Seunas were once the feudatories of the Rashtrakutas and then of the Western Chalukya. The founder of the Suena dynasty was Dridhaprahara, the son of Subahu. According to Vratakhanda, his capital was Shrinagara. 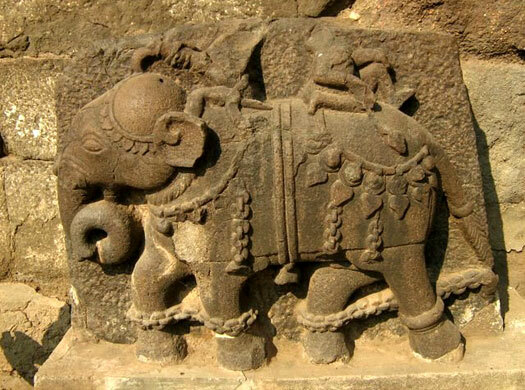 However, an early inscription suggests that Chandradityapura (modern Chandor in the Nasik district) was the capital. The name Seuna comes from Dridhaprahara's son, Seunachandra, who originally ruled a region called Seunadesha (present-day Khandesh). Bhillama II, a later ruler in the dynasty, assisted Tailapa III in his war with the Paramara king Munja. Seunachandra II helped Vikramaditya VI in gaining his throne. Bhillama V (1173-1192), son of Mallugi, established the sovereign Seuna kingdom. He took over the Chalukya capital of Kalyani in 1190 and founded Devagiri (now Daulatabad) as the capital of the Yadava dynasty. The Seunas were bordered by aggressive neighbours on all sides: Paramara Rajputs of Malwa in the north, Kakatiya dynasty in the east, Hoysalas in the south and Solanki Rajputs of Gujarat in the west. As a precaution, they built their citadel at Devagiri. The citadel was situated on a hill rising 183 meters (300 meters according to John Keay). The hill was enclosed by three lines of walls, each of which was defended by moats and turrets. The outermost wall had a circumference of 4.4 km. 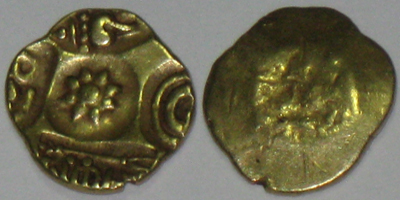 Singhana II 1200-1247 C.E. is considered the greatest ruler of the Yadava dynasty. During his rule the kingdom expanded from Narmada to Tungabhadra, reaching its zenith at the expense of Hoysalas in the south, Kakatiya dynasty in the east, Paramaras and Chalukyas in the north. He founded the town Shinghanapur (or Singhanapur). He was a great patron of learning and literature. He established the college of astronomy to study the work of celebrated astronomer Bhaskaracharya. The Sangita Ratnakara, an authoritative Sanskrit work on Indian music was written by Sharngadeva (or Shrangadeva) during Singhana II's reign. He also patronized Changadeva, the Kannada poet Kamalabhava. 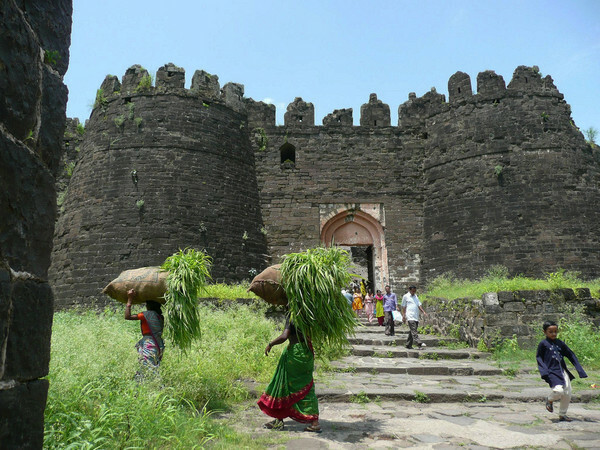 There is a belief that Deoghur or Doulatabad was built in 1203 AD by a Dhangar or herdsman (Yadav Cowherds) who acquiring by some unusual good fortune vast wealth was named by his brother shepherds Raja Ram and soon after assumed the rank of a Raja. Ramachandra (or Ramadevarava or Raja Ram), the grandson of Singhana II, ruled from 1271 to 1309 CE. Hemadri (or Hemadpant) was Ramachandra's Shrikaranadhipa (Chief Minister). He compiled the encyclopedic Sanskrit work Chaturvarga Chintamani. 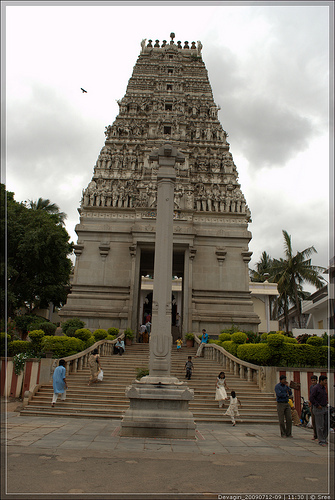 He is said to have built many temples in a style known after him - Hemadapanti. He also invented the Modi script for writing Marathi. Hemadri wrote many books on vaidhyakshastra (medical science) and he introduced and supported Bajra cultivation. In 1294, Ala-ud-din Khalji captured Devagiri. Khalji restored it to Ramachandra in return for his promise of payment of a high ransom and an annual tribute. However, this was not paid and the Seuna kingdom's arrears to the Khalji dynasty kept mounting. In 1307, Khalji sent an army commanded by Malik Kafur to Devagiri. Ramachandra was taken to Delhi. Khalji reinstated Ramachandra in return for a promise to help Khalji subdue the Hindu kingdoms in South India. In 1309, Malik Kafur mounted an assault on the Kakatiya dynasty from Devagiri. Alauddin Khilji invaded Devagiri once when he was the crown prince. Alauddin Khilji once again invaded Devagiri in 1306. The invincible Malik Kafur was on the spearhead of the army. He was accompanied with Khwaja Haji. The governors of Malwa and Gujarat were ordered to help Malik Kafur. The huge army conquered Devagiri almost without a battle. Alauddin Khilji appointed Raja Ramchandra the governor of Devagiri. He was given the title "Rai Rayan" (king of kings). Ramachandra's successor Singhana III challenged the supremacy of Khalji, who sent Malik Kafur to recapture Devagiri in 1310. Singhana III was killed in the ensuing battle and Khalji's army occupied Devagiri. Muhammad Tughluq subsequently renamed the city Daultabad. The kingdom was annexed by the Khalji Empire in 1317. Among the Seuna Yadava rulers, Sindhan, Krishnadev, Mahadeva and Ramdev are considered as having been 'able'. Bhillama II 975-1005 C.E., helped Western Chalukya king Tailapa II in battle against Paramaraking Munja. Seunachandra II 1068-1085C.E., overcame civil war, defeated Bhillama IV to become king. Their reign also saw the literary development of Marathi. The origin and growth of Marathi literature is directly linked to this period. Some historians believe that prior to the Yadava rule, both Marathi and Kannada had been used in Maharashtra; subsequently, at least partly due to their efforts, Marathi became dominant. Historian José Pereira has credited Yadavas with overthrowing the rule of Kannada-speaking dynasties in Maharashtra. Bhillama was the founder of Yadava (Also known as Jadhav) dynasty although it was his grandson Singhana, who made it the premier kingdom of Deccan. Singhana was great patron of learning and literature. He established the college of astronomy to study the work of celebrated astronomer Bhaskaracharya. We can read about his magnanimous donations which are carved in stone (written in earliest Marathi language) slabs in the temple of Goddess at Kolhapur in Maharashtra. Composition of famous works of scholars like Hemadri (who was responsible for introducing a style of architecture also called Hemandpanthi), Bopadeva and Dhnaneshwar (a prodigy who at the age of 16 translated Bhagavat Gita from Sanskrit to Marathi, perhaps the best and sweetest poetry ever written in Marathi) were composed during reign of Yadava dynasty. Bhillama V's son, Jaitrapal (or Jaitugi) had Mukundaraja, the author of Paramamrita and Vivekasindhu as his spiritual teacher. Paramamrita is considered the first systematic attempt to explain the Vendantic principles in Marathi. Vivekasindhu is another exposition of Vedantic principles. 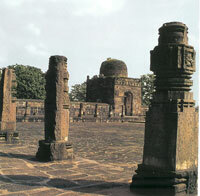 Mukundaraja's earliest works were completed in 1190 C.E. and Mahimabhatta wrote Lilacharita in 1238. I will speak my Marathi (language) only with pride and I will give such Marathi words to the ardent listeners which will even win bets against the nectar (amrit). Hemadri invented the Modi script during this period. Chakradhara propagated the Mahanubhava cult, using Marathi as the medium for his religious teachings. The work of his followers are counted among the first works of Marathi literature. Many scholars believe Kannada was one of the court languages during early Seuna times, as is evident from a number of Kannada-language inscriptions (see, Origin section). Kamalabhava, patronised by Bhillama V wrote Santhishwarapurana. Achanna composed Varadhamanapurana in 1198. Amugideva, patronised by Singhana II, composed many Vachanas or devotional songs. Chaundarasa of Pandharapur wrote Dashakumara Charite. Haripaladeva's Sangeetasudhakara, a treatise on Indian Classical Music, which bifurcates Indian classical music as Hindustani Music and Carnatic Music for the first time, acknowledging the Muslim influence on Indian music. Devgiri/Daulatabad (meaning “City of Prosperity”), is a city in Maharashtra, India, about 16 kilometers northwest of Aurangabad. The place was once known as Deogiri, (circa the sixth century AD, when it was an important uplands city along caravan route. 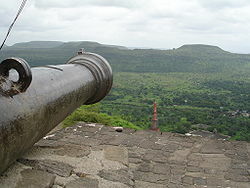 Yadavas had capital at Devagiri fort , perhaps the strongest fort of India. 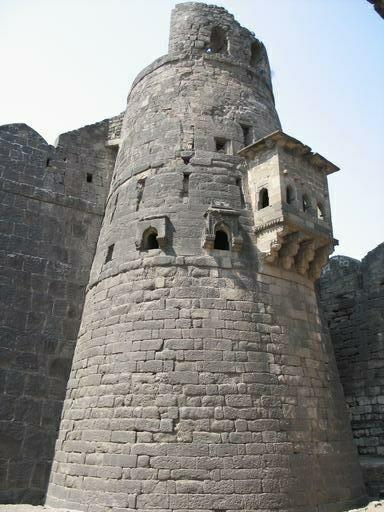 It is the best example of medieval fort building style. 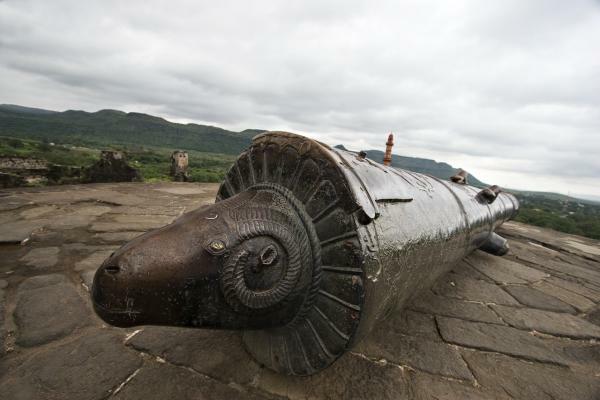 In spite of its strength, it fell to the first Muslim invasion of southern India. In 1294, Allauddin Khilji capured the fort defeating Yadava king Ramchandra. Khilji extracted massive amounts of gold and precious metals from Yadava king. Soon after in 1312 his general Malik Kafur again invaded Devgiri followed by masacre of members of royal family. Thus Hindu sovereignty in Maharashtra came to an end in 14th century after more than two hundred years of glorious reign of Yadavas. 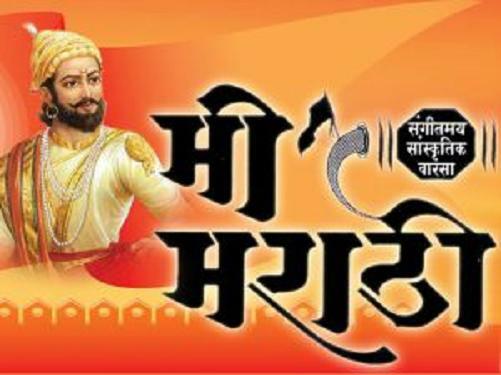 Thus for the first time Maharashtra was ruled by the Muslim invaders which was continued till Marathas again got united and emerged as supreme power in seventeenth century under command of Shivaji. Shown above is the nice example of a gold coin issued by Ramachandra Deva which shows `Trishul" (trident) below the legends. Lotus is shown in middle while conch is shown on top. 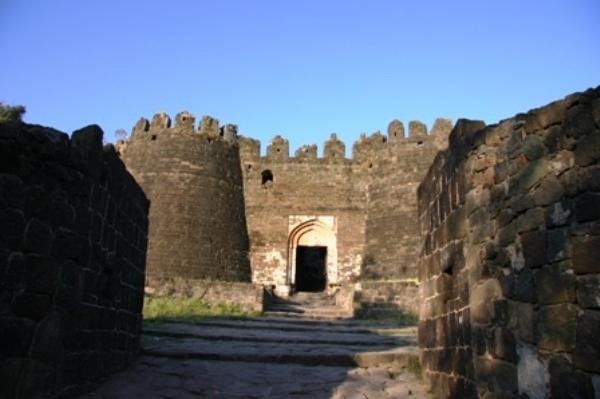 Deogiri was renamed as Daulatabad in 1327 by Muhammad Bin Tughluq. Starting 1327, it famously remained the capital of Tughlaq dynasty, under Muhammad bin Tughluq (r. 1325-1351), who changed its name from Deogiri to Daulatabad, and forcibly moved the entire population of Delhi here, for two years, before it was abandoned due to lack of water. The city of Daulatabad was built around the fort and it was because of the strength of the fort that Muhammad bin Tughluq shifted his capital to the Deccan. The area of the city includes the hill-fortress of Devagiri (sometimes Latinised to Deogiri). It stands on a conical hill, about 200 meters high. Much of the lower slopes of the hill has been cut away by Yadava dynasty rulers to leave 50 meter vertical sides to improve defenses. The fort is a place of extraordinary strength. The only means of access to the summit is by a narrow bridge, with passage for not more than two people abreast, and a long gallery, excavated in the rock, which has for the most part a very gradual upward slope. The original widespread capital city is now mostly unoccupied and has been reduced to a village. 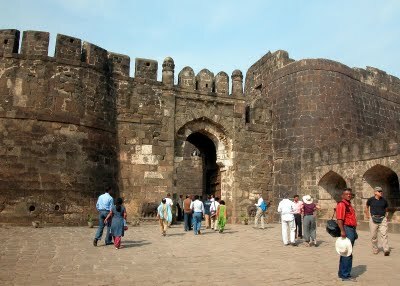 Much of its survival depends on the tourists to the old city and the adjacent fort. The site had been occupied since at least 100 BCE, and now has remains of Buddhist caves similar to those at Ajanta and Ellora. The city is said to have been founded c. 1187 by Bhillama V, a prince who renounced his allegiance to the Chalukyas and established the power of the Yadava dynasty in the west. 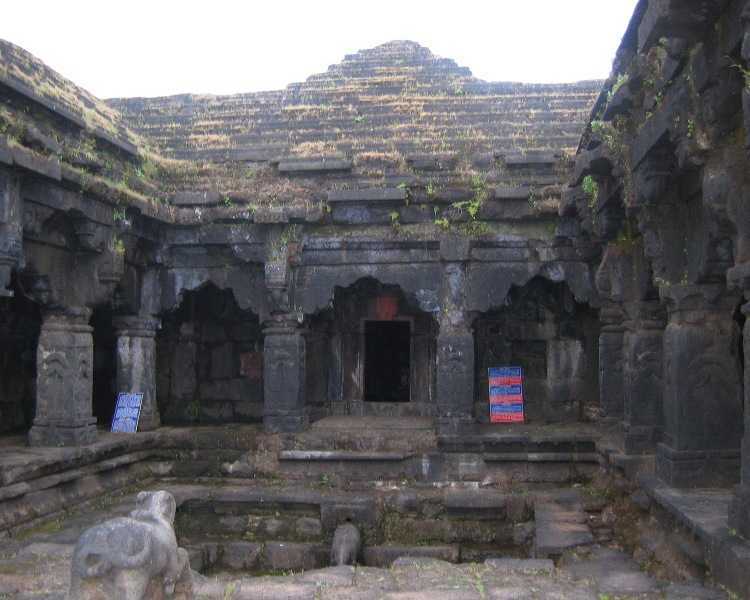 There is a tradition that Deoghur or Doulatabad was built in 1203 AD by a Dhangar or herdsman who acquiring by some unusual good fortune vast wealth was named by his brother shepherds Rajah Ram and soon after assumed the rank of a Rajah. In 1294 the fort was captured by Ala-ud-din Khilji, and the rajas, so powerful that they were held by the Sultans of Delhi to be the rulers of all the Deccan, were reduced to pay tribute. The tribute falling into arrear, Devagiri was again occupied by the Muslims under Malik Kafur, in 1307 and 1310, and in 1318 the last raja, Harpal, was flayed alive. Devagiri now became an important base for the operations of the Delhi Sultanate's conquering expeditions southwards. In 1327 Muhammad bin Tughluq determined to make Deogiri his capital, changed its name to Daulatabad , and tried to march the whole population of Delhi to it. The project was interrupted by troubles which summoned him to the north; during his absence the Muslim governors of the Deccan revolted; and Daulatabad itself fell into the hands of Zafar Khan, the governor of Gulbarga. It remained in the hands of the Bahmanis till 1526, when it was taken by the Nizam Shahis. It was captured by the Mughal emperor Akbar, but in 1595 it again surrendered to Ahmad Nizam Shah of Ahmednagar, on the fall of whose dynasty in 1607 it passed into the hands of the usurper, the Nizam Shahi minister Malik Amber, originally an Abyssinian slave, who was the founder of Kharki (the present Aurangabad). His successors held it until they were overthrown by Shah Jahan, the Mughal emperor, in 1633; after which it remained in the possession of the Delhi emperors until, after the death of Aurangzeb, it fell to the first Nizam of Hyderabad. 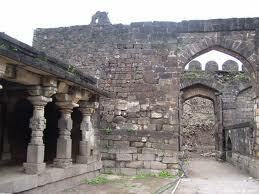 Its glory, however, had already decayed owing to the removal of the seat of government by the emperors to Aurangabad. The Fort which according to Indian ancient texts falls under the classification of Misra durg or mixed fort as it combines the qualities of Giridurg (mountain fort), Dev durg (God's fort) and Bhumi durg (land fort). The fortification walls were built at different periods by different dynasites like the Yadavas, Khilji, Tughlaq, Bahamani, Nizam Shahi and Malik Amber bears a marked resemblance to medieval European forts in the disposition of projecting towers, covered passages and bastions. The walls consist of labyrinth like arrangements of the underground secret passage with safety arrangements, in the style of buildings which give the bastions, despite their grim appearances, a touch of beauty by insertions of carved stones and dainty architectural details at various places. The fort has been considered as the most powerful, puissant fort that offered robust resistance to the enemies. An invincible fort, one of the best preserved in comparison to other forts in the vicinity of the same period. Its sound and sturdy quality exists due to the powerful wall about three miles in perimeter and defended by a moat and gacis that runs round the hill at its foot and between this outer curtain and the citadel, also known as Dharagir and Duwagir. 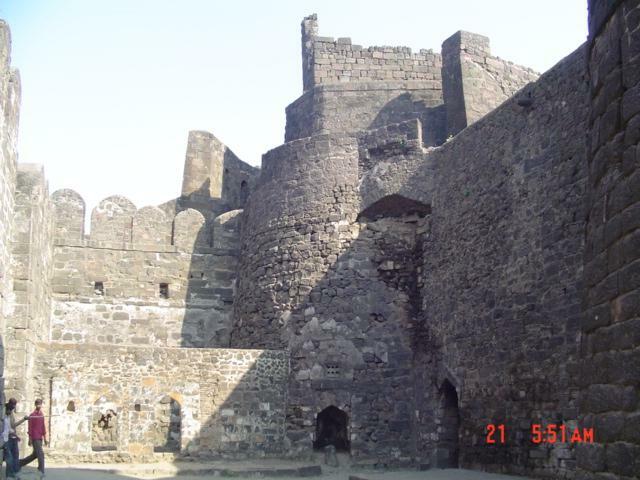 These details have been extracted from Professor Dulari Qureshi's book Fort of Daulatabad. " The outer wall, 2.75 miles (4.43 km) in circumference, once enclosed the ancient city of Deogiri (Devagiri), and between this and the base of the upper fort are three lines of defences. Besides the fortifications Daulatabad contains several notable monuments, of which the chief are the Chand Minar and the Chini Mahal. The Chand Minar is a tower 210 ft (64 m). high and 70 ft (21 m). in circumference at the base, and was originally covered with beautiful Persian glazed tiles. The Chini Mahal, or China Palace, is the ruin of a building once of great beauty. 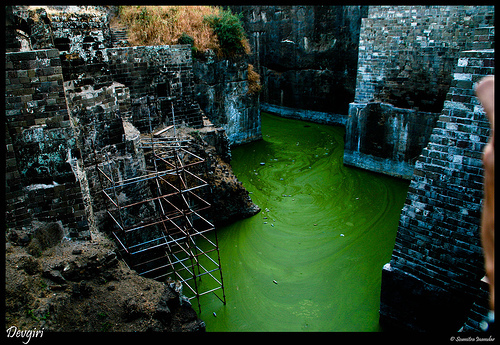 Daulatabad fort has many underground tunnels. Most of them have been closed or sealed. It is believedthat one such tunnel stretches from inside the fort to Rajur town where famous Ganapati temple is built. The tunnel's length is approximately 70 km. It is said[ that Daulatabad Fort's 'deep-mala' (lights tower) can be seen from Rajur temple.